It always has at its base, lots of creamy, healthy oats which provide the very distinctive flapjack texture and flavour. But oats are a bit of a tricky customer when you have coeliac disease and caution needs to be exercised when eating them. Some Coeliacs cannot eat them at all, because although they technically do not contain gluten, they have some similar properties to which Coeliacs may be highly sensitive, resulting in an unwelcome reaction. When my daughter was first diagnosed, we were advised to remove all oats from her diet for the best part of a year whilst her body recovered from pre-diagnosis damage and then to very gradually reintroduce them to test the impact. We were fortunate......... she can eat oats, for which I am grateful......... They are healthy and when added to baked goods as a flour, help support the binding process because of their slight 'stickiness'. But they have to be 'gluten free' oats. "But surely oats are oats?" I hear you say. No! Oats (and for that matter any other field grown seed or grain) will be potentially cross-contaminated from other crops which have self-seeded from previous crop-cycles. When they are harvested and milled, those other crops (including wheat, barley and rye which are dangerous to Coeliacs) gate-crash the party and end up in the bag. Next time you see a field of oats, look closely across the level top of the crop............ I was astounded at what else was growing alongside! 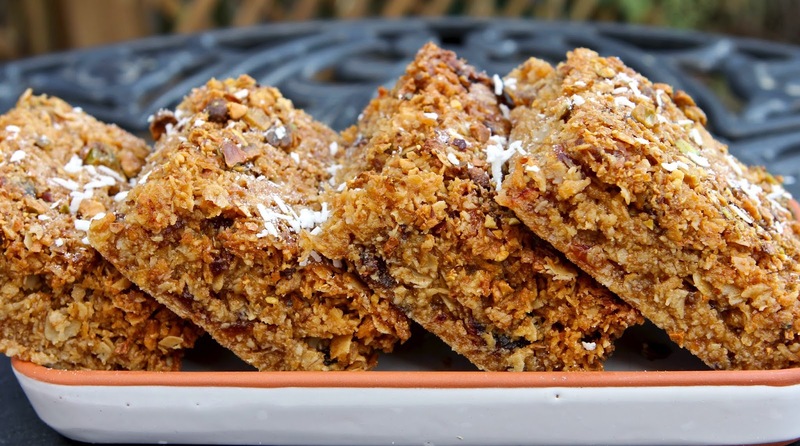 Flapjacks are a really easy treat. They have a good shelf life, can also be frozen and travel well without getting easily squashed or over-heated. They are perfect for school lunches, providing care is taken to keep a check on levels of unrefined sugar. These particular flapjacks have been prompted by the need to use up a few ingredients which have been hanging around in the cupboard for a while......... A third of a box of Anjoman dates, a handful of dried apricots, left over chopped pistachio from some biscuits I recently made and some Greek honey that I bought on holiday last summer. Having decided that the apricots and dates would compliment each other, I decided to throw some desiccated coconut into the mix. Not wanting to over-do the sugar (and aiming for at least a reasonable score in the health stakes), these flapjacks are also made using honey in place of golden syrup and a goodly portion of coconut oil instead of butter, which also enhances the coconut hit. In hindsight, I should have dumped the butter altogether, but I was having a cautious day and (unusually for me) didn't want to 'risk' it. The finished flapjack tastes really wholesome. It is soft and chewy in texture, not too sugar-sweet and has a good balance of chewy dates and apricots set against the creaminess of the oats. The coconut is not over-powering, but can definitely be picked out from the blend and mingles well with the other flavours. The pistachio nuts on the top add a wonderful nutty crunch and also a touch of distinctive green for visual temptation. Because of the need to use up a whole bunch of ingredients in making this flapjack, I am entering it into the No Waste Food Challenge, being guest-hosted for July by Anne at Anne's Kitchen on behalf of Elizabeth at Elizabeth's Kitchen Diary. 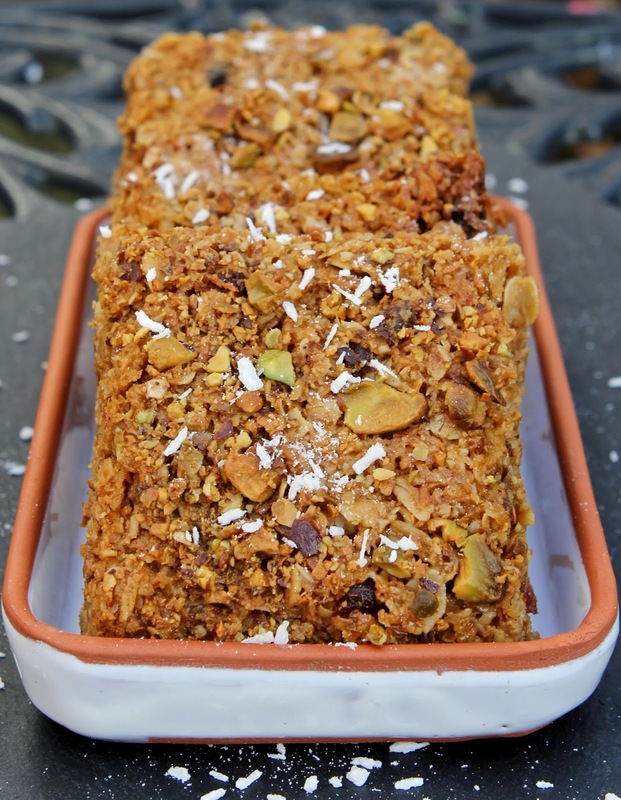 Finding ways to use up stray ingredients and left overs can be a bit of challenge, but flapjack is always a great way to 'dispose' of surplus fruit and nuts. I hate waste and the No Waste Food Challenge is great for focussing the mind on creative ways to ensure there is as little as possible. I am always amazed at the array of culinary inventions on display by the end of the month in the challenge round-up! 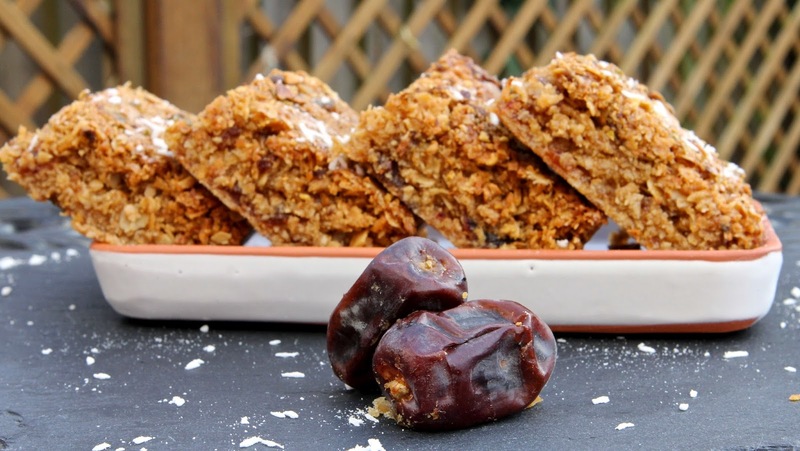 This month, Tea Time Treats is also asking us to link up with our flapjack and tray bake recipes and is being hosted by Janie at the Hedgecombers on behalf of Karen (Lavender & Lovage). The very first blogging challenge I undertook was a Tea Time Treats flapjack and tray bake event, back in October last year. It seems like a long time ago now, but I made flapjack then too, with roasted summer fruit. This recipe is very different but is just as delicious! Base-line a 20 cm/8 inch square baking tin with baking paper. 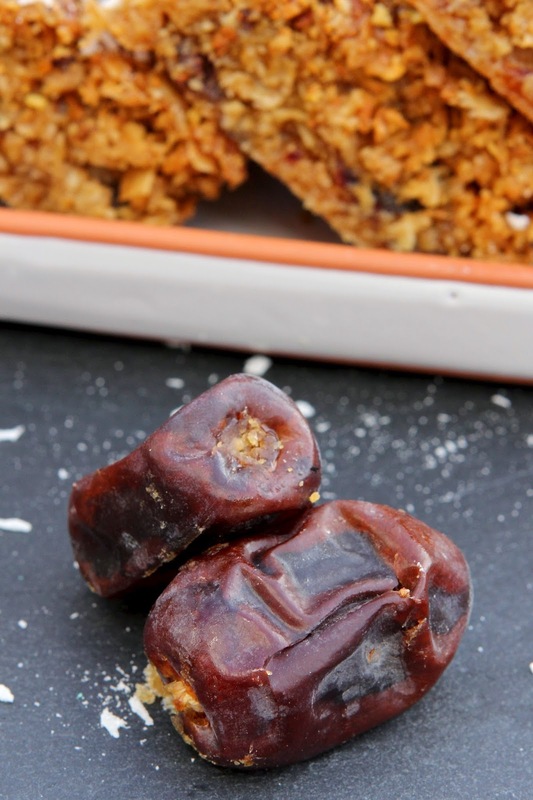 Chop the dried apricot and dates and mix with the coconut. Set aside. Pre-heat the oven to 150 C/300 F/Gas 3. In a large saucepan, melt the butter, coconut oil, honey and sugar over a low heat, stirring well to combine. Remove the pan from the heat and add the oats and fruit. Stir thoroughly. Spoon the mixture into the baking tin and push into the corners. Smooth the surface with the back of a spoon. Sprinkle a handful of chopped pistachio nuts on top and gently push into the surface. Bake for 30 to 40 minutes until the edges are beginning to brown and the mixture has firmed up. When still a bit warm, score the surface with a sharp knife to mark out pieces. When cool, remove from the tin and cut into slices. I tasted flapjacks in the UK for the first time. What's not to like about flapjacks? There is something about them that's so addictive. 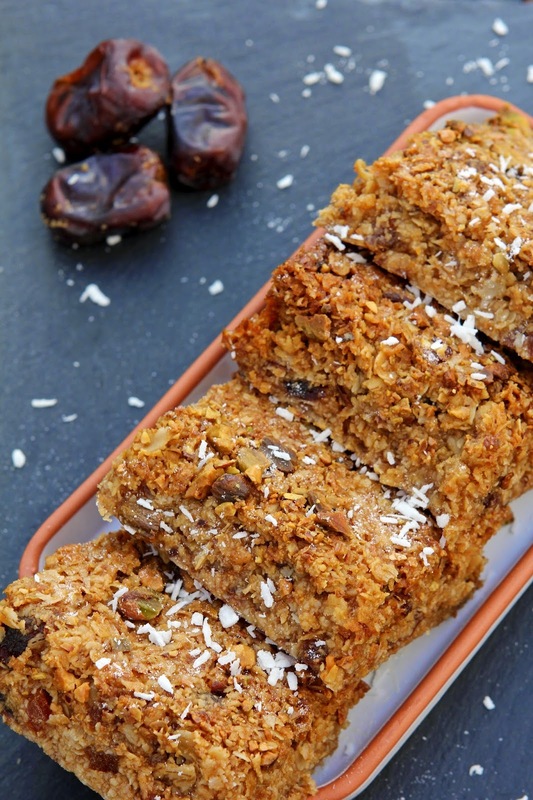 I love the ingredients you have used here: dates and apricots are just ever so moreish and with the coconut.. well just the perfect combination! 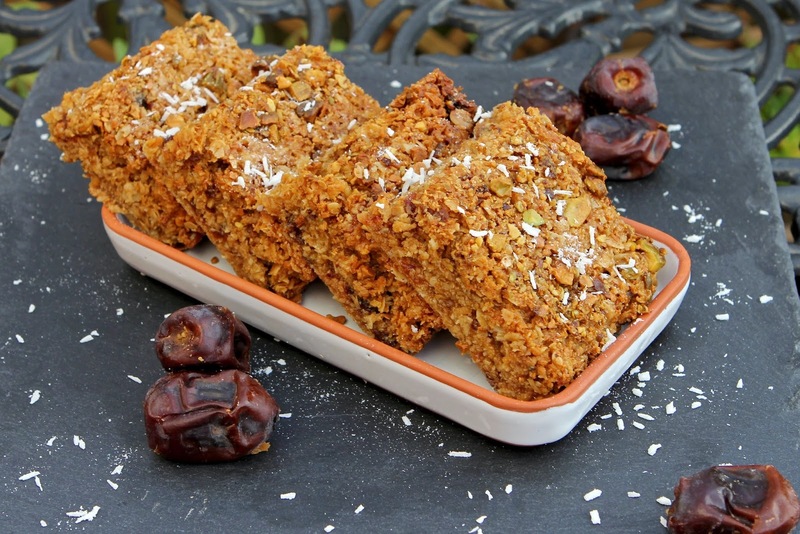 Thank you so much for entering this month’s No Waste Food Challenge – your flapjacks look delicious, I love making them too to use up all the random bags of fruits and nuts! Keep up the great work! You're welcome Anne...... and thank you! Delicious! I adore flapjacks, and these looks fab. Thanks so much for sharing them with Tea Time treats! You're welcome Elizabeth. 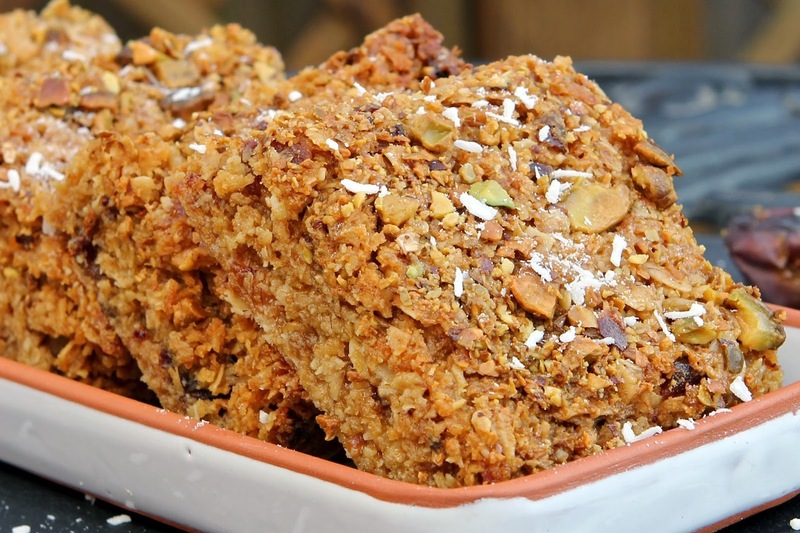 Flapjacks are always a fab way to use stuff up!